Posted byBramus! October 30, 2008 January 31, 2018 35 Comments on PS_BRAMUS.TextConvert: PSD2TXT and TXT2PSD for the masses! What if you could extract all text strings from a PSD file into a TXT file? Sure, it’s possible, thanks to PS_BRAMUS.TextExport, the PSD2TXT script I wrote a few months ago. Now, what if you wanted to do that in the opposite direction and import strings from a TXT file into a PSD file (viz. TXT2PSD)? Look no further, PS_BRAMUS.TextConvert is here, and does both! The first script is a modded version of PS_BRAMUS.TextExport which scans your PSD file for text strings. After retrieving all text, the output is saved into a TXT file in your Documents folder. The second script is the counterpart: it reads in TXT files (which you first exported via the first script) and replaces all text layers with the new content in your PSD file. Is PS_BRAMUS.TextConvert something for me? PS_BRAMUS.TextConvert is ideal for agencies/companies who need to translate Photoshop mockups: Export all text layers via PS_BRAMUS.TextConvert.Export to a text file, send that text file to the translation agency and let them do the translation, then import the translated file via PS_BRAMUS.TextConvert.Import into the PSD file. PS_BRAMUS.TextConvert released under a MIT license. Should you use the script within a commercial context, or if you want to put a smile on my face, please consider making a donation. Note: PS_BRAMUS.TextConvert was made possible by means of lexia:park, Barcelona, Spain. 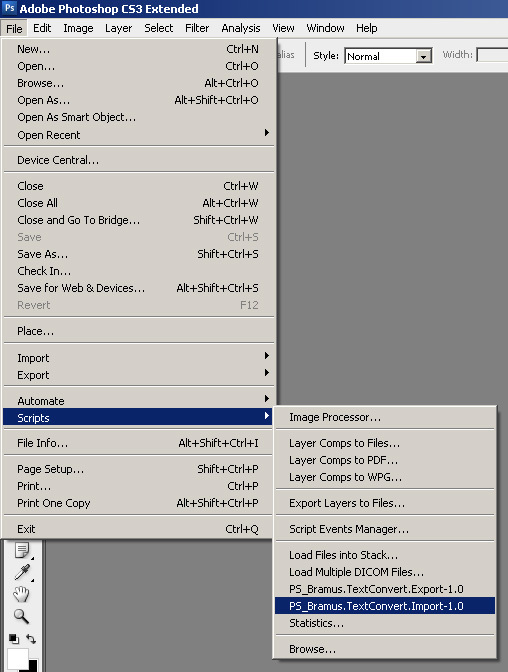 In Photoshop go to File > Scripts and select PS_BRAMUS.TextConvert.Export-1.0 from the list to export all text. Save the text file with the same name in the same location. In Photoshop go to File > Scripts and select PS_BRAMUS.TextConvert.Import-1.0 from the list to import all text. Please note that PS_BRAMUS.TextConvert.Import is not compatible with any version PS_BRAMUS.TextExport! Please note that in between the running of the Export and Import NO CHANGES TO THE PSD FILE can be done! Now, did you download PS_BRAMUS.TextConvert already? Did this help you out? Like what you see? Consider donating. Pingback: ????????? » PSD ?????????? I meant, I would like to run the script on all files in a given folder. I selected the export script and an empty text file opened. Have run it on PS4 Portable. Seems not to work with Korean text though. Works with Latin and Cyrillic characters. Sorry, I cannot donate as I’m not able to use PayPal. What about Webmoney? Wow, this is actually working 🙂 Thanks! Pingback: (TOOL) – PS_BRAMUS.TextConvert: export PSD2TXT and import TXT2PSD | Bram.us | Glossarissimo! Just did a quick test and it seems to work perfectly in Photoshop CC – thanks! I had the same problem. Is there any support for languages in Unicode/UTF-8? Hi Bram, I just sent you an email but I thought I might leave a comment too as I’m hoping to get a response quite desperately and this might help others in the future with the same issue. First of all thanks so much for developing such a great plugin. I have a problem, when I reimport the txt all the content comes in ok but the text size changes of many of the layers. Do you know what might be causing this? I’m using Mac and CC Photoshop. Good thing you’ve also replied here as it looks like I didn’t get your mail. Regarding the issue you’re having: this isn’t something I’ve encountered myself before, nor have heard from anyone else. Does it happen with *all* PSDs, or just one? Tried on CC 32 bit and it works… but not with Russian. French and Spanish seem OK. This is a great plugin – Thank you! However, I would really like to be able to specify the location of the extract file. I’ve never done any scripting but I’ve had a look at the file and I’ve found the bit I would need to change but I have no idea how to change it. this script is great but is there anyway that it can word doc can be populated in reverse. My PSD files once exported as a text file has the copy from the bottom layer at the top of the word doc and continues down – my very first layer from photoshop is at the bottom of the text doc. is there a way around this? Hi Bramus, this script does not maintain the same character formatting when we import text, for eg. if any paragraph has multiple styles (like bold, italic, etc) it does not remain in same formatting when we import text. Do you have any solution for this? I’m making a comic with two language versions to manage and this script will save a lot of trouble. Thank you sir! Fout 60:Onjuiste vorm (ongeldig token). I tried your script about a year ago with the same result and then removed it from Photoshop and left it as it was. I now downloaded your script again, reinstalled it but still this error. This is a life saver if you have a comic book in couple languages! Thanks! !